Savoring the art of Peace: KWS Promotes the Memory of 911 with A Fundraiser for two International Women’s Organizations! Twin sisters from the Washington area have created a charitable event to observe the tenth anniversary of the terrorist attacks on Washington, DC, and New York City. The sisters are Sherry Burton Ways, Principal of Kreative Ways & Solutions, LLC, and Sharon J. Burton, CEO of Authentic Contemporary Art. Co-sponsoring the event with the sisters is East City Art. The event, “Savoring the Art of Peace” Wine Tasting Fundraiser, will take place from 6 to 9 p.m., Friday, September 9, 2011, at SOVA Espresso & Wine Bar, 1359 H. Street, N.E., Washington, DC 202-397-3080. Website: http://savoringtheartofpeace.eventbrite.com/. The cost per person is $55.Thefirst 25 patrons will receive a complimentary gift. 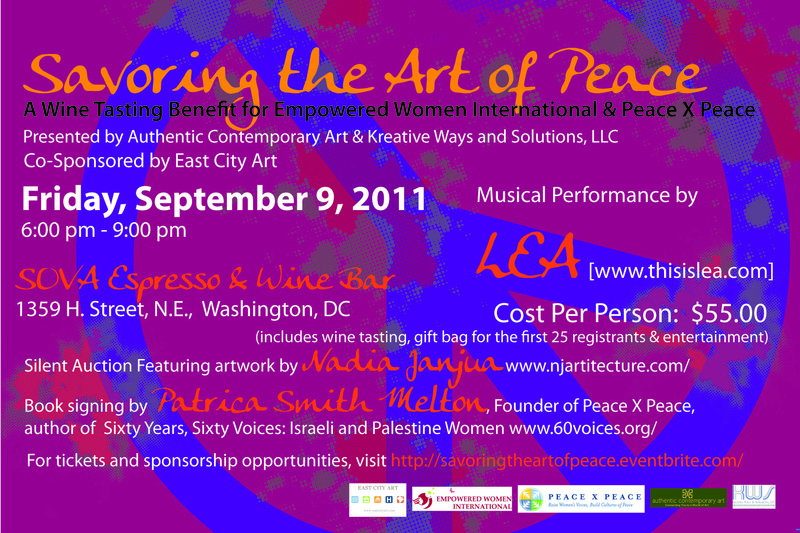 he event benefits Peace x Peace and Empowered Women International. Patricia Smith Melton, founder of PeacexPeace, will have available for purchase and sign copies of her book, Sixty Years, Sixty Voices, which carries the voices of 30 Israeli women and 30 Palestinian women who share their wisdom, experiences, points of view, wounds and joys. Attendees can sample up to three regional wines and gourmet cheeses. Maryland artist Nadia Janjua will feature her work in a silent auction and of LEA, a DC-based singer and song writer, will provide entertainment with her acoustic guitar. Sherry Burton Ways (http://www.kreativeways.com/) has been designing in DC since 2004. With a studio at 1341 H Street NE in Washington, Ways focuses on designing interiors that promote health and well-being, using principles of color therapy, Feng Shui and eco-friendly design. She also helps clients with real estate staging, accessorizing and special events decorating. Ways was chosen as one of Home & Design’s 2011 Top 100 Designers in the Washington, D.C., Region. Ways serves on the Board of PeacexPeace (http://www.peacexpeace.org/). PeaceXPeace began in 2002 when Patricia Smith Melton, a poet, playwright, film maker, and photographer, gathered six experts in peace and women’s rights from around the world to discuss how they might respond as women to the violence of 9/11/2001. The organization was incorporated as a 501(c)(3) nonprofit to connect women internationally to build peace. It launched a website and an online news service and began connecting women across geographic and cultural divides, via the Internet. The expanding PeacexPace community includes women and men in more than 100 nations. Empowered Women International (EWI) creates economic, market, and career opportunities for low-income immigrant and refugee women and seeks to raise awareness and increase appreciation for the cultural contributions that immigrant and refugee women and their families make to our country. Members of EWI also believe in the extraordinary power of the arts as a unifying language of communication and multicultural understanding and as a vehicle of integration for newcomers. Author Patricia Smith Melton brings the power of women’s wisdom into a world of need and violent conflict. She first met with Israeli and Palestinian women in 2004 as founder and executive director of Peace X Peace, which weaves a network of internet-based communication for all women of the world. A poet, playwright, and former entrepreneur, Smith Melton co-founded one of the earliest social networking programs, the Melton International Education Foundation, connecting students in Chile, China, Germany, India and the US. Fans and friends so often compare LEA’s sound to greats like Tracy Chapman and Joni Mitchell that it seems a good starting point to describe her music. There are also shades of India.Arie, Ani DiFranco and Bonnie Raitt in her singing, writing and guitar playing. By infusing elements of Jazz, Country, Gospel & R&B into contemporary Folk, LEA creates a sound that is all her own. LEA’s music is enjoyed by a variety of audiences who share an appreciation for pure, engaging vocalization, expressive guitar style, intelligent lyrics and skillful song craft. Those audiences include presenters at arts centers, universities, festivals, coffeehouses, nightclubs, vineyards, churches and house concerts in the US and Europe. LEA has released 7 full-length CDS and has been repeatedly acknowledged by the Washington Area Music Association as one of the area’s Best Female Vocalist, Recording Artists and Songwriters. Visit LEA’s website at http:www.thisislea.com .